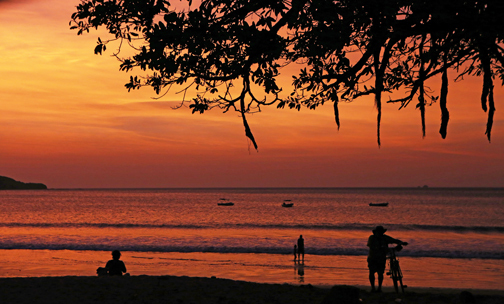 The quaint little township of Brasilito is located in the Guancaste area on Costa Rica’s famous Gold Coast. The area is mostly undeveloped so don’t expect to find any expensive resorts or hotels in town. 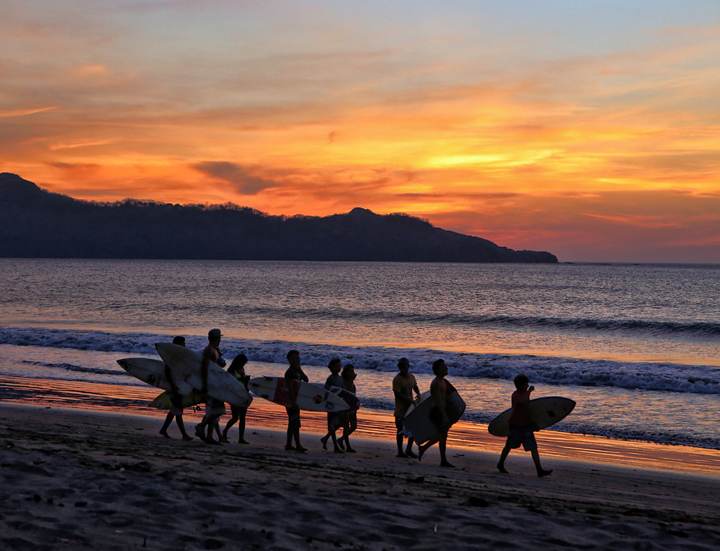 However, this little coastal town will feed your scenic appetite some of the most glorious sunsets and beaches available in Costa Rica. 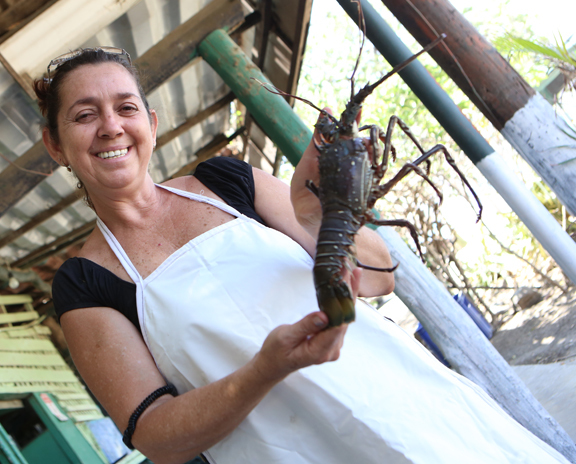 Brasilito consists of mostly locals giving one a true representation of the way of life in Costa Rica. 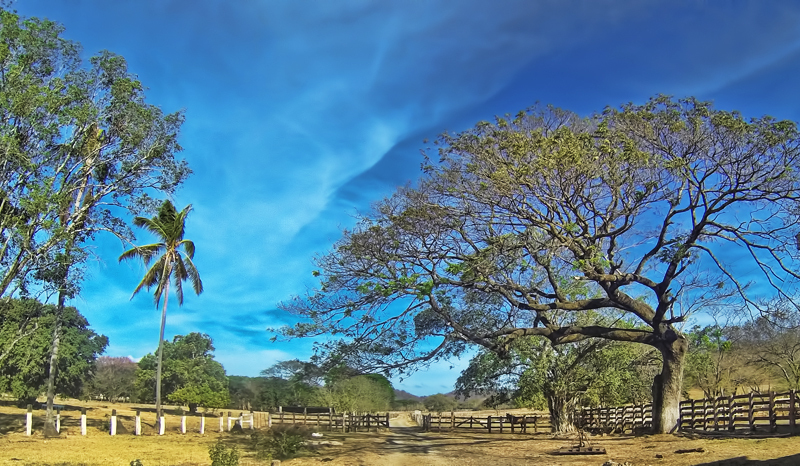 It’s also an ideal place to stay for budget travelers and for accessing some of Guanacaste’s parks and biological reserves too. One of the world’s most important beaches for sea turtles called the “Marino Las Baulas National Park”, is just a short walk south of town. Sea turtles of various species come ashore there to perform their nesting rituals. 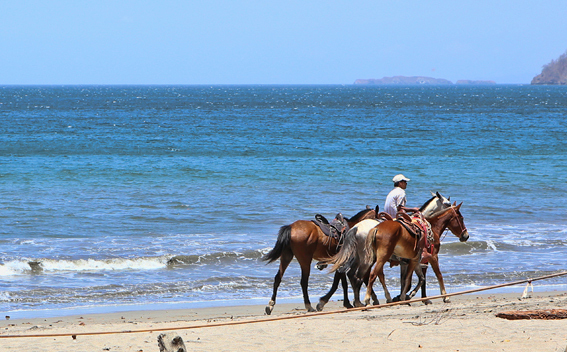 You will also find Conchal Beach nearby, one of the most popular beaches located along the Gold Coast of Costa Rica, a long crescent shaped beach formed of white sand and tiny crushed sea shells for which it gets it’s name. A very secluded beach with crystal clear blue water excellent for snorkeling and favored by the locals year round. The Hotel Brasilito is just a few steps from the beach and offers very reasonable accommodations and satisfactory amenities for the area. The hotel provided excellent views of Brasilito Beach with the solitude of the Pacific Ocean waves washing ashore However, the highlight was the waves one by one leaving shimmering reflections of the magnificent colorful sunsets in the sand as each wave returned to the sea. To me that was a gift worthy of a canvas for a traveling photographer. The restaurant scene consisted mainly of mom and pop eateries called Sodas. Although a couple restaurants in town do cater to the visiting tourists whom seem to stray off the beaten path. Sodas are located throughout Costa Rica. Sometimes the Sodas’ can be a small family owned grocery store or a small diner style restaurant. The Sodas’ normally offer plate dishes known as “typical food” and most had different versions. The main staple of a typical breakfast meal is a plate of rice and beans served with eggs, cheese and toast, a dish called “Gallo Pinto”. For lunch and dinner you normally have “Casado” which means “married” in Spanish. A Casado plate consists of rice, usually black beans with some type of meat or fish, fried plantains, and a cabbage salad which often had a bit of carrot and tomato, the basic variables found in almost all Costa Rican cuisine. A well-rounded delicious meal with some decent nutritional balance. Expect to pay approximately $4 to $7 for a plate of typical food. 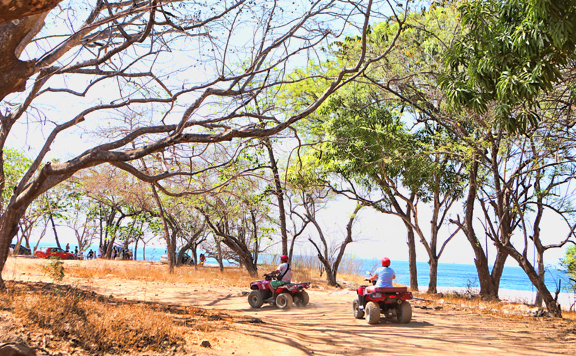 ATVs were available for rental and gave us the opportunity to explore the beach and nearby wooded areas in search of the resident Howler Monkeys. We did find a troop sleeping high in the tree tops but weren’t able to get any decent photos. 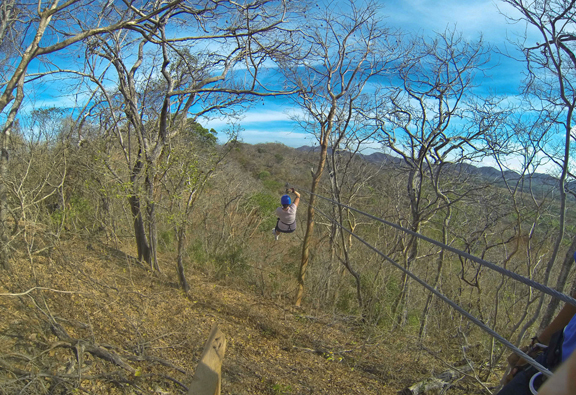 The following day we decided on a zip-line excursion, about a 30 minute drive from the hotel. Upon reaching the zip-line location we had to make a brief stop for gear. Continuing our drive through a working cattle ranch up a sloping hill to the tree tops, we finally reached the first cable. We were pleasantly greeted by a large troop of energetic Howler Monkeys playing in the trees. We ended up co-sharing the tree tops with the monkeys along part of the zip-line course.The overall experience added to the excitement and made us feel even more enthusiastic as we looked forward to the rest of our trip. Brasilito was the perfect location to kick-start our Costa Rican trip. A quiet romantic area for relaxing and taking in the views of the awesome beaches, beautiful sunsets, and enjoying life as the locals do. 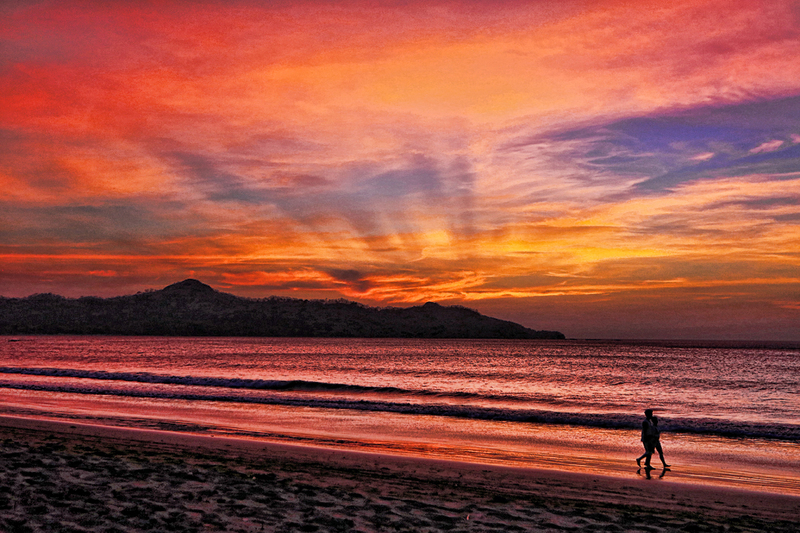 Image | This entry was posted in Dining and tagged Beaches, Brasilito, Brasilito Hotel, Conchal Beach, Costa Rica, Costa Rica Vacations, gold coast, Guanacaste, Marino Las Baulas National Park", sunsets. Bookmark the permalink.